09.00 Hrs. 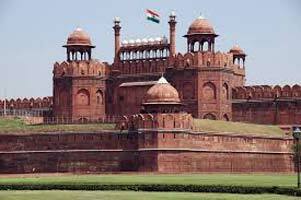 : This morning our driver will pick you up for Delhi City Tour. 09.30 Hrs. 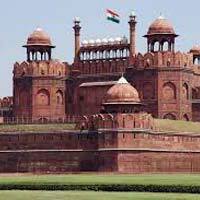 : This grand fort built during the Mughal emperor Shah Jahan's reign, this majestic building made of red sandstone is the location from where the Prime Minister of India addresses the natin every Independence Day. The Diwan-e-Khas, and Diwan-e-am, the weaponry museum and the sound and light show are all worth seeing at the Red fort. 10.15 Hrs. : Built during the reign of the Mughal Emperor Shah Jahan, one of the largest mosques in India, the Jama Masjid's large courtyard, onion domes and central tank are built of red sandstone and white marble in the Indo-Islamic style. 11.00 Hrs. : The place where the remains of Mahatma Gandhi have been places, set amidst exotic trees and fountains. 11.45 Hrs. : Akshardham Temple in New Delhi is an enlightening jou ey through India's glorious art, values and contributions for theprogress, happiness and harmony of mankind. The complex was inaugurated on 6 November, 2005. Akshardham means the ete al, divine abode of the supreme God, the abode of ete al values and virtues of Akshar as defined in the Vedas and Upanishads where divine bhakti, purity and peace forever pervades. For the first time ever in the world witness the heritage of India in all its facets, insights and beauty at the Akshardham temple, the most beautiful garden & other attraction. 1.00 Hrs. : You will stop over an Indian traditional restaurant to have lunch and continue you tour. 1.30 Hrs. : Formerly the Vice-regal Lodge, the building is the presidential palace. It was completed in 1929 at a cost of 12,000 pound sterling and has 340 rooms. 1.45 Hrs. : Situated on Rajpath, in the center of Delhi, this 42-meter high arch, was designed by Edwin Lutyens, in memory of the Indian soldiers who sacrificed their lives during the first World war. Their names can be seen inscribed on the arch. The Amar Jawan Jyoti, an ete al flame, bu s in memory of the unknown soldier, beneath the shelter of the arch, which is surrounded by green lawns, fountains and water bodies-an evergreen picnic zone in the heart of central Delhi. 2.45 Hrs. : Built by Humayun's Wife, Hamida Begum, in 1556, after Humayun's death, this elegantly proportioned tomb, set on a platform amidst a garden, is believed to have influenced the design of the Taj Mahal. 3.00 Hrs. : This aesthetically designed monument, commonly known as the Lotus Temple, because the white marble structure is built to in the shape of a lotus, set amidst, lakes and green lawn. It is a serene house of meditation, within which there are no idols and total silence prevails, so all can meditate in complete peace. 4.00 Hrs. : Built during the reign of Sultan Qutub-ud-din aibak in 1199 A.D., this 72.5 m high pillar is a symbol of the DelhiSultanate. Near it can be seen the ruins of Kila Ri Pithora, the fort of Prithviraj Chauhan, and an amazing iron pillar from Gupta times which has no yet rusted. 5.00 Hrs. : Built by Nawab Shauja-ud-Daula in 1753 to preserve the remains of his father, this tomb has been described as "the lastflicker in the lamp of Mughal architecture." 5.30 Hrs. : The first of five observatories built by Sawai Jia Singh II of jaipur (1699-1743), the structure has huge masonry instruments. 6.00 Hrs. : By evening retu to you Hotel for ovenight stay.